A cold beer might have seemed like one of the few remaining foods or drinks safe from the Sriracha invasion. But that is no longer the case. 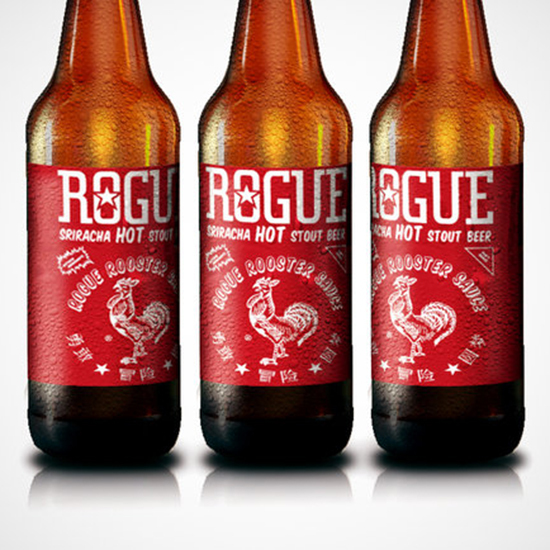 Rogue Ales has got a stout with a healthy dose of rooster sauce. Now, the details have begun to flow like a spicy stout into a pint glass. In a post today, Rogue unleashed the awesome packaging featuring a bright red bottle and, of course, a distinctive green cap. The brew is an official collaboration with the world’s most recognizable Sriracha brand, Huy Fong, so the artwork even includes everyone’s favorite rooster. Also unveiled was a preorder link. For $13 plus shipping and handling, your bottle of Sriracha Stout will be one of the first shipped out on December 8th. According to the product description, this brew “is ready to drink with soups, sauces, pasta, pizza, hot dogs, hamburgers, chow mein, or anything you'd like to wash down with a spicy kick.” Not much info is given about the stout’s flavor profile, but lest you think this is just a gimmick from Rogue, you should know they’ve succeeded with spicy beer before. One of the brewery’s best known beers is their Chipotle Ale which has been a company staple for over a decade, and even earned a “world class” rating from Beer Advocate back in 2002.